Typically, latches are made of metal to achieve a needed durability against environmental conditions and protection against external forces. However, in use metal parts tend to wear and they may loosen over time. Thus, worn metal latches do not work properly and may even open by themselves. In some applications rubber locking segments are used. However, rubber tends to perish over time, especially when exposed to environmental conditions such as UV radiation and weather. 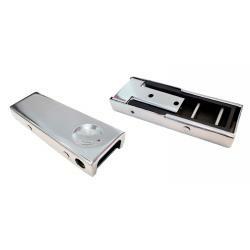 The objective of the X-Latch was to develop a latch durable in all conditions. X-latch solves both of these issues by combining the best elements of stainless steel and rubber latch in just one product making it the most user-friendly latch in the market. In the X-latch the top part is made of stainless steel AISI316 that creates an elegant and beautiful finishing. Apart from well-thought design, it also protects the rubber part from direct sunlight preventing ageing due to UV. The inside of the latch has all the benefits of a rubber latch &ndash; It tightens well, and it doesn&rsquo;t open even in rough boating. Due to the slightly bigger design, the latch is easy to use for example with thick fishing gloves.